Virchow-Robin spaces (VRS) or the perivascular spaces (PVS) are normal interstitial fluid filled cystic structures in the brain. They are about 1-2 mm in size, typically lined by pia mater and are common in places where the penetrating arteries and arterioles enter into the substance of the brain. ,,, In this article, we report a child with incidentally detected giant tumefactive perivascular space (GTPVS). A 4-year-male was referred to us for further management of cystic lesions which were initially mistaken for cystic neoplasm. He had a recent minor head trauma subsequent to a fall. He never lost consciousness and did not have neurological symptoms including headaches, vomiting and seizures. A computer tomogram done at an outside facility showed cystic lesions. He did not travel outside the United States and has no exposure to pets or farm animals. Physical examination including neurological system was within the limits. No evidence of papilledema was found on fundus examination. 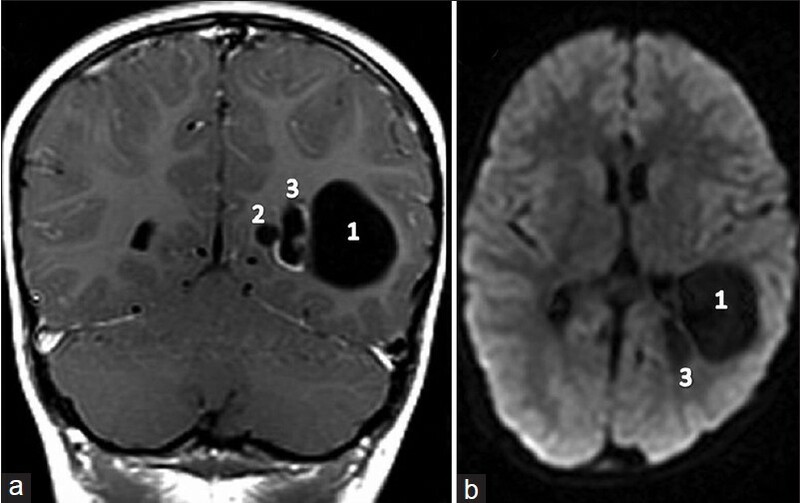 A magnetic resonance imaging (MRI) showed three clustered cystic areas in subcortical white matter near the atrium of left lateral ventricle. The larger cyst (ovoid shaped lateral cyst) was located in the left temporo-parieto-occipital region, measured 34 Χ 32 Χ 42 mm and was located just lateral to the atrium of the left lateral ventricle [indicated by number '1' in the [Figure 1], [Figure 2],[ Figure 3]. Two smaller cysts were also identified. One of them measured 8.1 mm (spherical shaped medial cyst) in diameter, and was located medial to the posterior horn of the left lateral ventricle in the occipital region [indicated by number '2' in the [Figure 1] and [Figure 3]. The other smaller cyst (ovoid shaped central cyst) was located in between the two above mentioned cysts [indicated by number '3' in the [Figure 1] and [Figure 3]. This cyst measured 8.3 Χ 20 Χ 24 mm, and the choroid plexus was noticed in the periphery. The posterior horn and atrium of left lateral ventricle were distorted due to the pressure effect from these cysts. All the three cysts were hypointense in the T1-weighted sequences and hyperintense in the T2-weighted sequences. The intensity signals of the cysts were isointense to the cerebrospinal fluid (CSF) in all the sequences. No evidence of hydrocephalus or midline shift was found. There was no enhancement of the cystic wall after the administration of gadolinium [Figure 1]b, [Figure 2]b and [Figure 3]a. There were no restricted diffusion [Figure 3]b and there were also no areas of calcification. From the asymptomatic nature and classical radiological appearance, GTPVS was diagnosed. The patient was initially referred to pediatric neurology service. A decision to follow conservatively was made and he was seen a year later. In the interval period, he did not develop any symptoms. A repeat MRI was done a year later and showed the same findings without any increase in size or number of the cystic spaces. The patient was also referred to neurosurgery consultation and a conservative long-term follow-up was advised. We conclude that physicians need to be aware of the typical imaging characteristics of GTPVS so that unwanted invasive neurosurgical procedures or frequent repeated imaging of the brain can be prevented. 1. Oztürk MH, Aydingöz U. Comparison of MR signal intensities of cerebral perivascular (Virchow-Robin) and subarachnoid spaces. J Comput Assist Tomogr 2002;26:902-4. 2. Salzman KL, Osborn AG, House P, Jinkins JR, Ditchfield A, Cooper JA, et al. Giant tumefactive perivascular spaces. AJNR Am J Neuroradiol 2005;26:298-305. 3. Kim DG, Oh SH, Kim OJ. A case of disseminated polycystic dilated perivascular spaces presenting with dementia and parkinsonism. J Clin Neurol 2007;3:96-100. 4. Ogawa T, Okudera T, Fukasawa H, Hashimoto M, Inugami A, Fujita H, et al. Unusual widening of Virchow-Robin spaces: MR appearance. AJNR Am J Neuroradiol 1995;16:1238-42. 5. Fayeye O, Pettorini BL, Foster K, Rodrigues D. Mesencephalic enlarged Virchow-Robin spaces in a 6-year-old boy: A case-based update. Childs Nerv Syst 2010;26:1155-60. 6. Fanous R, Midia M. Perivascular spaces: Normal and giant. Can J Neurol Sci 2007;34:5-10. 7. Heier LA, Bauer CJ, Schwartz L, Zimmerman RD, Morgello S, Deck MD. Large Virchow-Robin spaces: MR-clinical correlation. AJNR Am J Neuroradiol 1989;10:929-36. 8. Groeschel S, Chong WK, Surtees R, Hanefeld F. Virchow-Robin spaces on magnetic resonance images: Normative data, their dilatation, and a review of the literature. Neuroradiology 2006;48:745-54. 9. Kwee RM, Kwee TC. Virchow-Robin spaces at MR imaging. Radiographics 2007;27:1071-86. 10. Bayram E, Akinci G, Topcu Y, Cakmakci H, Giray O, Ercal D, et al. 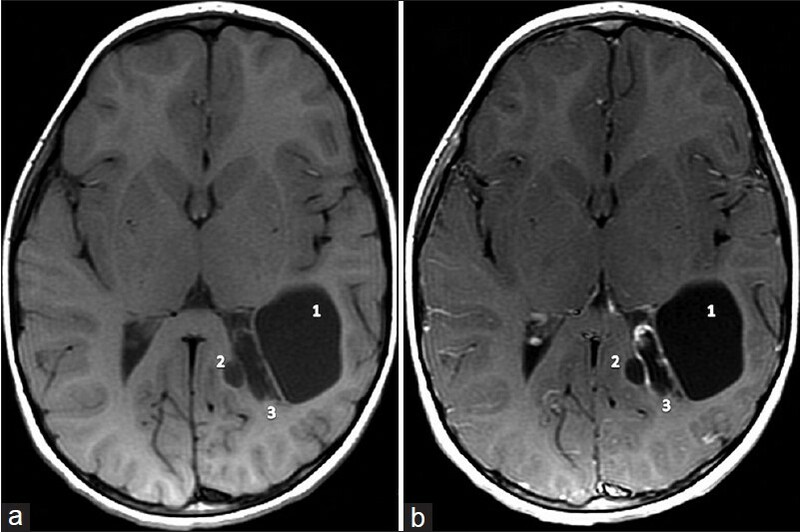 Multi-cystic white matter enlarged Virchow Robin spaces in a 5-year-old boy. Childs Nerv Syst 2012;28:743-6. 11. Bruna AL, Martins I, Husson B, Landrieu P. Developmental dilatation of Virchow-Robin spaces: A genetic disorder? Pediatr Neurol 2009;41:275-80. 12. Poirier J, Gray F, Gherardi R, Derouesnex C. Cerebral lacunae. A new neuropathological classification. J Neuropathol Exp Neurol 1985;44:312. 13. Kanamalla US, Calabrò F, Jinkins JR. Cavernous dilatation of mesencephalic Virchow-Robin spaces with obstructive hydrocephalus. Neuroradiology 2000;42:881-4. 14. Stephens T, Parmar H, Cornblath W. Giant tumefactive perivascular spaces. J Neurol Sci 2008;266:171-3. 15. Wani NA, Mir F, Bhat IM, Gojwari T, Bhat S. Giant cystic Virchow-Robin spaces with adjacent white matter signal alteration. Turk Neurosurg 2011;21:235-8.